When luxe swimwear brand Onia invited us to tag along on a sailing trip around the British Virgin Islands on an Alquila Vela catamaran with four of the world’s top fashion bloggers, our suitcases practically flung open on their own. We knew two things right away: First, we had a lot of packing to do. Second, we were in good hands. Thanks to our experienced travel companions below, all of our beachy getaway questions were answered with ease. 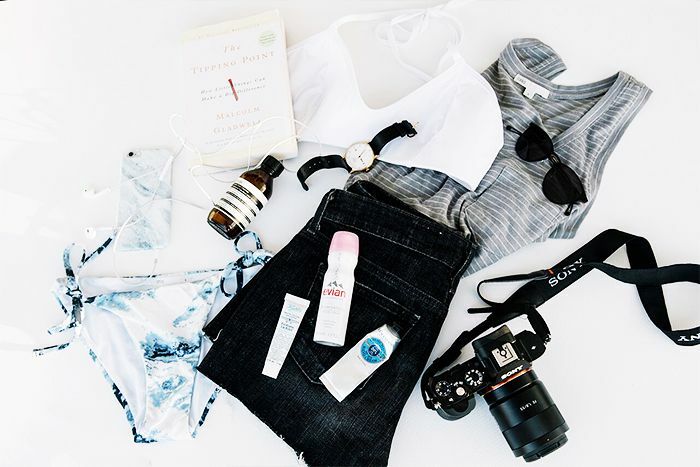 Whether you’re also setting sail this summer or jetting off to a tropical destination, scroll down for insanely good vacation advice and insight from the ladies behind We Wore What, Trop Rouge, Just Another Fashion Blog, and Haute Inhabit. What's your packing process like? "I put my outfits together beforehand, and take photos on my phone so I don’t forget. I’ll also bring five to 10 extra items that I love just in case I want to default back to anything." Do you have any must-know packing tips? "I stuff small things like underwear into my shoes to keep their shape." "My vacation style is—as my style generally is—very easygoing. Super-casual and comfortable because you’re going on vacation to relax, so why not let your clothes be the same way?" Do you gravitate toward one swimsuit style in particular? "Currently, one-pieces. But if I don’t want weird tan lines, I also like a sporty bikini that gives more support." What are your go to cover-ups and accessories? 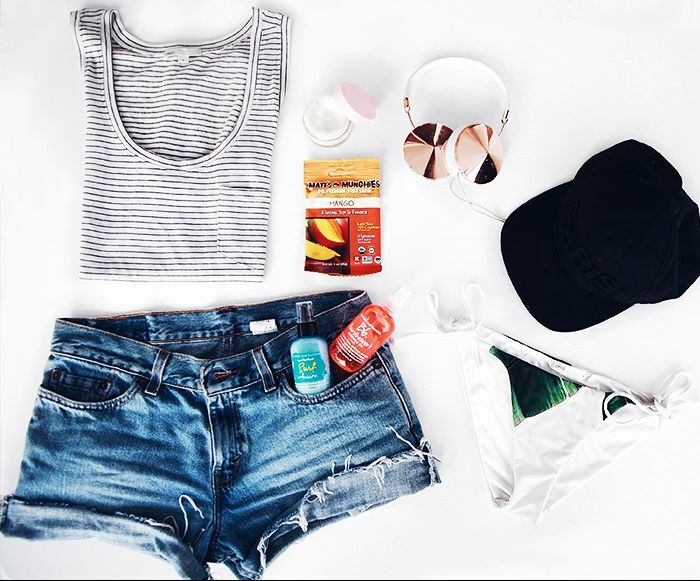 "A T-shirt and denim shorts for cover-ups, and a big wide-brimmed hat and slides for accessories." If you were stranded on an island, what would be your three fashion essentials? "An oversized T-shirt that could work as a dress, a simple black one-piece, and a headband to keep my hair out of my face." "My vacation style is back to the roots. I let my hair go natural, and I don’t wear a lot of makeup. I’ll put on some bronzer once I get out of the water, but that's about it. I grew up in a beach town, so I feel like it’s back to when I’m home. Go with the flow." 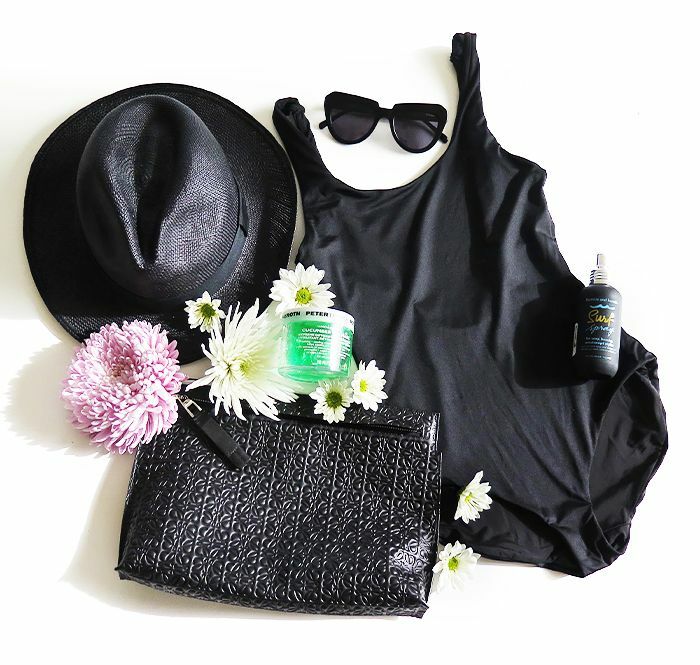 What accessories do you pack for a tropical summer getaway? "I pack a straw hat or a baseball cap, and then espadrilles, an open-toe sandal, and maybe some Keds. Not too much jewellery." Do you have a favourite swimsuit style? "I don’t like triangle tops, but I love bandeaus and one-pieces. I love bandeaus for the tan." If you were stranded on an island, what would your top three fashion essentials be? "A straw hat, a pair of jean shorts, and sneakers. Is that it? Actually, I want a onesie. Romper overalls, because that counts as two things. And a notepad. I don’t need shoes; I want a notepad." Is there a common packing mistake people should avoid making? "I think people bring things they’ve never worn that they think they’ll wear while on vacation. I’ve made this mistake before. If you’ve never worn it, you ain’t gonna wear it now. I went on a cruise and had all this cruisewear I’ve never worn before in my life, and I was like, What have I done? People should just bring things they already wear. It’s more comfortable that way." "My trips are usually pretty organised. I spreadsheet everything by day, and I also put the weather in there too so I know exactly what to wear for what. I’ll bring a few extra pieces because you never know, but I generally don’t overpack anymore. I’ve learned over a while how to do it." Do you carry on or check? "If it’s a weekend, I carry on always, and if it’s more than two days or a huge trip, I definitely check a bag." "I used to like bandeau, and then I got into triangle, and now I’m moving more into one-pieces. I like one-pieces because my theory is that the more fabric you’re wearing, the more expensive it looks. A one-piece can look a lot more elegant than a bikini." What are your favourite cover-ups? "Love kaftans. I like to stay out of the sun as much as possible while in the sun, and I think kaftans cover up the most on your body. The bigger the kaftan the better." What are your top three island fashion essentials? "A really big hat, a tiny bikini so I get an even tan, and a flowy linen dress." Is there anything you think people should avoid packing on a beachy getaway? "I wouldn’t pack more than two pairs of shoes. I think you can always live with two pairs of shoes. Also, you don’t need that many accessories. If you pack consistently with everything else you can use the same accessories every day, and that’ll take up less space. If you have just one bag that goes with every outfit, then you’re golden." "My vacation style is a relaxed version of what I wear every day. Flattering swimwear is the most important, paired with really awesome cover-ups. I always wear my body chain and delicate jewellery for accessories." Do you think there is a universally flattering type of swimwear? "A vintage swim fit is the most flattering. The raised hip and low back elongates the torso and makes your legs look slimmer." "I make a list on an email draft or note starting at least a week before as I think of things I want to wear on my vacation. I write them down so packing is easy." Is there a common packing mistake you think people should avoid making? "I always overpack shoes. You really just need a core three pairs—sneakers, sandals, and one pair of heels." Do you have a must-know travel tip? "My number one travel tip is Downy Wrinkle spray!" Are you going on a tropical vacation this summer? Did you find any of these tips useful? Share which ones in the comments below!